My book ‘Pe-nsion in the Defence Services’ was released yesterday by the Western Army Commander. The book is a commentary and compendium of pension related provisions and orders from the Fourth till the Sixth Pay Commission. Other allied benefits such as military insurance modalities, declaration of battle casualties, miscellaneous beneficial provisions etc are also covered in this hard bound book. A press report on the same is reproduced below. One request though – please do not send me queries on procurement of the book since I would not like to associate myself with the commercial aspect of it, such queries will be answered by the distributors through their website http://www.defencepension.wordpress.com/ which can also be accessed by clicking here. Thanks for all the support. A book on defence pensionary, allied provisions and regulations for armed forces personnel was released by Lt Gen TK Sapru, General Officer Commanding-in-Chief, Western Command, at Chandimandir today. Titled “Pension in the Defence Services”, the book is authored by Maj Navdeep Singh, a High Court advocate and a decorated Territorial Army (TA) volunteer, according to a release issued here. Former Delhi High Court Chief Justice RN Aggarwal and former Vice Chief of the Army Staff, Lt Gen S Pattabhiraman have written the forewords. The book contains orders issued by the Central government and service headquarters, notifications, various provisions related to service, disability and family pension, group insurance benefits and battle casualties, along with associated commentary. Pension related orders issued after the Fourth Pay Commission till the Sixth Pay Commission and tables detailing pay and pension of different ranks, are also carried. 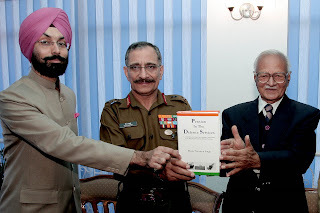 The book was released amidst a gathering of senior Army officers and retired judges. Speaking on the occasion, General Sapru dwelt upon the need to educate officers and jawans on various provisions concerning pension-related entitlements and orders issued by the government from time to time and appreciated the efforts undertaken by the author in this regard. Congrats on the release of your new book on Defence pension. I would recommend for you to consider looking at lulu.com for book publishing.They deliver both physical & e versions. A comprehensive, uptodate, authentic and relevant book was very much required. Good to see Maj Navdeep is continuing his good work for the Retired Fauzis also, whom we often tend to forget. Congrats. Good job done. We look forward to revised edition in times to come once anomalies are taken care of and things stabalise. Wish you more laurels ahead!! Maj Navdeep Singh is providing yeomen service to the servicemen both during as well as to yesteryears. I don't have suitable words in my little dictionary to convey my happiest version. Congratulations !!! It is for the defence community who matters at the helm of affairs to think of recommending Major Navdeep Singh for appointment in bench " Armed forces Tribunal" or such other deciding body where his willingness and expertise could be further gainfully made use of. many congrats for blowing ur trumpet modestly. keep up the good work!! I'm very sure that every unit in the Indian Armed Force will try and procure a few copies. One suggestion is get your publishers to contact NDF(National Defence Fund) which procures books in lot for distribution to all the defence forces units. I'm also greatful for knowing your calibre you would have put in heart and soul and plenty of research before you would have got down to writing this book. well ther's no doubt that the book will do well. All the best and God speed!!! Congratulations and thanks on bringing out the long awaited book. I'm sure this'll go a long way in educating most of us. May I also request you to kindly publish a book on soldier's status and pay and perks vis a vis his civilian counterpart both pre and post independence over a period of time. It would let us understand our folly of not knowing our worth and giving our services virtually free at the cost of our family ( including in terms of emotions and future of our children ), self respect,time ( 24 x 7 ),growth and goals. It will also wisen the common man, who loves the Indian soldier as to how The Indian Soldier has been cheated while He was busy defending The Motherland from external aggression and internal disorders. Please accept my heartiest felicitations, though belated on your birthday. You have done for us what unfortunately,those responsible have not been able to do for their command. I have been trying to obtain a copy of the Pension Regulations for the Army ,in vain so far. I do have copies of a lot of orders and correspondence on the subject collected by me during service and also thereafter. But a comprehensive publication has been the need of the hour and I am very glad that you have undertaken this job of providing the same at a very opportune time. I could not open this blog in the morning but I saw the email in which this publication was referred to and I immediately requested u for the address for obtaining the copy;the prompt reply you gave me has been circulated among my contacts of Armed forces. You have NOT BLOWN UR OWN TRUMPET but HAVE Propagated a very important message in this blog. My warm and hearty congratulations for your effort in stitching together all the information into a hard bound book.Wishing you many more such efforts to educate our"ILLITERATE" faujis who had never bothered so far to verify the correctness of their dues both in service and after retirement. Thanx once again for the publication and congratulations once more. CONGRATS ! on the release of your book on defence pensions. You have addressed a much wanted but generally ignored tequirement. We are now benefitted by a valuable reference source. I do hope you will issue ammendments and addendums as and when they happen. Well Done again Navdeep. I wish you had waited a little till the PB4 notification was issued. Now that the Hon.PM is back in his chair, I am sure the notification and SAI will be issued in a few days time.After all it is the PM who has agreed for the PB4 for Lt Cols. PB-4 for Lt Cols would not make any difference in pensions except the fact that pre-06 Lt Cols would move from 17063 to a basic of 25700, a fact that is adequately covered in the book. My hearty congrats and many thanks from Faujis. Yeah there is real fire in you - for action than mere talk to do service to Faujis / Do good in ones life. I cannot refrain myself from stating - All those VSMs , AVSMs ,PVSMs from personnel brs of Def Forces,M O D , CDA(p)/CCDA/PCDA (huge est &elevated designations) did not present/publish a comprehensive booklet on this sub despite so much of manpower,time , resources ,finances.....etc. since INDEPENDENCE . Probably people get awards and promotions for psychophency and saving from legitimate pensions (short changed/deprived/cheated) of those soldiers who gave their prime life for the present peace and prosperity prevailing now. Heartiest congratulations and felicitations on such an honourable achievement. This step will go a long way in ensuring education related to our pay and perks. Is there any further info on the issue of Disaility Pension?As to why it has not been accecpted by MOD?What recourse can affected persons take etc? Heartiest congratulations on the release of your book. I am very sure that with your caliber and hard work this book would certainly fill a wide gap and would be of immense help. Congrats Navdeep. Knowing you,the book would be a gem. We are looking forward to have a copy of your book in our hands as it would clear a lot of doubts. Keep up the good work. Are you aware that Colonels have been placed in the equivalence of 14300 scale and not the 15100 scale? Grade pay remains 8700 for both but there is a loss of approx 1300 as on 01 Jan 06. This would have a bearing on the fixation of pay for Lt Cols as well. Hope they are not looking at reducing the start of PB-4 from the existing 37400! Please give wide publicity to this mistake (?) in fixation of Colonels' pay. Hope CDA(O) rectifies it soon. Way to go, man. Great job done. Congrats and bash on regardless of ponzies and "prags";-) I will definitely get a copy. And no, you are not blowing your own trumpet, we will blow it for you. Again, congrats and prost. Heartiest congratulations on release of your book. It will go a long way in educating all of us about the nuances of pension for Fauzis. Why dont you also think of something like CDA handbook for officers. We all are really looking fwd to it. Heartiest Congratulations on such an Honourable achievement . What you have done for all Army Pers is commendable.At least I could see a person so dedicated in his profession doining a wonderfull work for all of us. In fact not much of the pers are in knowledge of all what you have published. Pl accept heartiest congrats! Afantastic presentation indeed.Any latest on SAI? Imean with regards to inclusion of LtCols in 4th pay band. After visiting you and hearing your thinking, I at once guessed that the GOD is in your soul. Your heart is beating for all army family. Hence, upcoming of this book is also an advance step for serving a society as a whole. I with my all colleagues and family members congrates and wish that the GOD bless you to keep such things up.